Every month since June 1998 Speechwoman has selected a speech-language pathology / speech and language therapy related site of the month. Sometimes it is not so much a site, as a page, blog entry or resource within a site that is worthwhile celebrating here. If they wish, awardees may display the Speechwoman logo on their winning site, post, page or resource (scroll down for two versions of the logo). Warm congratulations to all Speechwoman's winners, including those whose hard work has "gone" from the Internet! It's early days for this nascent website, but with Drs Suze Leitão, Mary Claessen, Mark Boyes and Peta Dzidic, and Mandy Nayton OAM at the helm, Speechwoman recognizes promise when she sees it. Language and Literacy in Young People is the web presence of an energetic and productive group of researchers and Higher Degree Research (HDR) students, based at Curtin University in Western Australia. Their research focuses on informing understanding of oral language and literacy (speaking, understanding speech, reading and spelling) development and disorders in children and young people. It already boasts an impressive range of freely downloadable research reports, assessment and intervention resources, and Apps. If any or all of the hashtags, #DevLangDis, #SLCN, #HRQOL, #Dyslexia, #MentalHealth, #LaLYP and #YouthJustice pique your interest, set aside an hour or so to delve into this (already) content-rich site. Marion Blank, PhD is an international authority on literacy and language who developed and served as Co-Director of the Columbia University Developmental Neuropsychiatry Program for Autism and Related Disorders. Speechwoman's pick for Fabruary is a compilation of 32 short videos, uploaded to YouTube by ASD Reading, in which Dr Blank talks about literacy, and other intervention with individuals on the autism spectrum. So wise. Conceptualised by speech pathologist and Griffith University researcher Simone Howells, this remarkable cook book was created by Master of Speech Pathology students in Griffith's School of Allied Health Sciences.The beautifully illustrated 75-page book with pictures and design by the talented Kirsty Gordom, is downloadable as a PDF (see above). It is bursting with a tempting array of recipes for people adhering to a soft diet, a minced and moist diet, or a pureed diet, and for those without special dietary requirments who like to experience something deliciously different. Speechwoman has her eye on the Spiced Pumpkin Curry with Creamy Polenta. An added bonus is links to other recipe treasures: Dining with Dysphagia: A Cookbook (click to download the e-book PDF), #D4DA Cookbook PDF, Swallow Study Nutritious Smoothie PDF, and Oak House Kitchen Recipies. Congratulations Simone and the 2014, 2015, 2016, and 2017 student cohorts. This is a wonderfully simple but helpful tool from Genetic Alliance. It is intended to guide critical thinking—you DO have to think—about the quality of the health information that is available on websites (including social media sites) and in books, handouts, journals, podcasts, and other sources. Click on Who said it? When did they say it? and How did they know? to guide you through the process.You can follow Genetic Alliance's Twitter handle. This is the third of five 2018 webinars delivered by Dr Tanya Serry B.App.Sc. (Sp. Path), M.A. (App.Linguistics), PhD, an academic at La Trobe University. Click on 1, 2, 4, and 5 to access the others in the series. These 45 minute presentations portray Dr Serry's deep knowledge of the particular skills required for literacy learning, and reveal her expertise in communicating science with clarity and grace. This excellent series, designed for teachers and everyone else interested in evidence-based education in general, and the Phonics Debate in particular, is in stark contrast to the unscientific misrepresentation of decodable texts by three Australian phonics-naysayer academics, ill-advisedly (or perhaps extremely courageously in the Sir Humphrey Appleby sense) showcased in The Conversation on November 1, 2018. Elsewhere in the blogosphere, Professor Pamela Snow provides excoriating discussion of the Adoniou, Cambourne, and Ewing (2018) outburst. As they say, you can lead an ideologue to data, but you can't make him think. In a departure from normal practice, Speechwoman has bestowed the October 2018 Site of the Month award on three worthy recipients - no protests now, she makes the rules. Between them, these excellent resources provide a wealth of information about Developmental Language Disorder (DLD), still referred to in a diminishing number of places as Specific Language Impairment (SLI). Explore these pages and be informed, impressed, and inspired to dig further into the research around this prevalent disorder. Congratulations, people! This excellent free access article in ASHA's American Journal of Speech-Language Pathology represents a decade of work, which the researchers, Sharynne McLeod and Kathryn Crowe have pulled together beautifully here. This is one of those highly readable must-read-must-keep pieces for all SLPs/SLTs who work with children. Download it, print it out, and stash an electronic copy in your Documents. Speechwoman's advice? While you're at it, tell your colleagues it's there, and tell Sharynne and Kate what you think! The American Speech-Language-Hearing Association (ASHA) is dedicated to making effective communication, a human right, accessible and achievable for all. ASHA’s Board of Directors approved [on August 8, 2018] new position statements that discourage use of two particular techniques, Facilitated Communication (FC) and the Rapid Prompting Method (RPM), because they lack scientific validity and do not foster independent communication. Both statements were open to peer review by all interested parties. ASHA stands firmly behind its members in support of effective services leading to independent communication for those they serve." Blog Post: Stuart Vyse provides an account of FC and RPM in "Autism Wars: Science Strikes Back"
For the third time in 20 years, Speechwoman has chosen a Facebook presence as Site of the Month. This time it is an evidence-friendly, effectively run closed group: SLPs for Evidence Based Practice. Founder, Tatyana Elleseff administers it with help from Maggie May, Shawna Pope-Jefferson, Kelly Ryan-Ibañez, and Louise Zingeser. Its almost 24,000 members are SLPs from around the world who profess an interest in and commitment to evidence based practice in SLP/SLT. Established on August 13, 2016, the group's central purposes are to promote critical thinking and independent inquiry among members through reasoned discussion and enquiry, information exchange, and resource sharing. The mood is collegial, welcoming, quietly scholarly, and pleasantly "professional". SLPs/SLTs with a range of clinical, academic and research backgrounds and interests contribute generously and informatively to discussion of a wide range of EBP/E3BP topics. SLPs/SLTs everywhere can ask to join. Expect to answer a handful of important questions about yourself before gaining admission. GamesWithWords.org is a Web-based research laboratory. The quizzes and projects are research studies probing the nature of language. Speechworman enjoyed the quizzes, including Which English? Frequently asked questions about tongue-tie (ankyloglossia) answered on the Speech Pathology Australia website. "A speech pathologist is one professional who can identify tongue-tie along with doctors, lactation consultants, dentists, paediatricians, ear nose and throat specialists, and maxillo-facial surgeons..." Click on the pdf, on the page linked above, to download a clearly written, jargon-free account of the ins and outs of tongue-tie. This blog post by Lyn Stone is compelling and essential reading for all SLPs/SLTs, particularly those working with clients with complex communication needs. Chloe, Lyn's eldest daughter of three, died peacefully in her sleep on the night of April 12, 2018. "The review starts with an overview of the most recent findings associated with our understanding of early language and preliteracy development. It goes on to look at prevalence and at the proportion of children not attaining the appropriate levels of attainment in the early years. It then turns to interventions, their efficacy and effectiveness, and contextual factors that affect their implementation. Finally, we move on to the way that services are delivered on the ground in England and highlight the profile of five local authorities, the services they deliver, and factors affecting that delivery. The review ends with a summary of the main findings and recommendations for which interventions could usefully be taken forward. In the Appendices we provide summaries of the interventions identified and a table of interventions and their outcomes and then provide some additional details about the five case studies identified in Chapter 5." with severe or profound intellectual disability. The helpful Practice Leader Guide has been developed for practice leaders who seek to improve approaches to working with people with CCSN at their service. Anderson, K L. (2016) Communication: First Principles. Centre for Applied Disability Research. Available at www.cadr.org.au. Using data from the Australian Bureau of Statistics 2015 Survey of Disability, Ageing and Carers (SDAC), this important article presents an overview of communication disability in Australia, and the impact it has on the everyday lives of those who are affected by it. The SDAC is designed to measure the prevalence of disability in Australia and the need for support for people with disability. It collects detailed information from three target populations living in households as well as those in cared-accommodation: people with disability; older people (those aged 65 years and over); and people who care for those with disability, who have a long-term health condition, or who are aged 65 years and over. The article includes a link to Speech Pathology Australia's pdf Fact Sheets, which include Speech Pathologists Working with Older People, and an Easy English version of the same information. "Developmental Language Disorder (DLD) is identified when a child has problems with language development that continue into school age and beyond. The language problems have a significant impact on everyday social interactions or educational progress, and occur in the absence of autism spectrum disorder, intellectual disability or a known biomedical condition. The most obvious problems are difficulties in using words and sentences to express meanings, but for many children, understanding of language (receptive language) is also a challenge, although this may not be evident unless the child is given a formal assessment." This comprehensive Wikipedia page, developed by meticulous DLD experts/researchers in 2017, is a mine of accurate information about this prevalent but little-known neurodevelopmental disorder. Readers interested in the DLD page may also want to read an article by Maggie Snowling: Dyslexia and developmental language disorder: Same or different? The inaugural Developmental Language Disorder (DLD) Awareness Day was on September 22, 2017. The occasion was marked by functions at University College London, the University of Sydney, and other locations worldwide, and coincided with the publication a special issue of the Journal of Child Psychology and Psychiatry (JCPP), edited by Courtenay Norbury, devoted to DLD, a new video from the RADLD campaign, featuring the irrepressible Eddie and Dyls, and another by the equally irrepressible Dorothy Bishop. Readers can have free access to the entire JCPP issue until October 31, 2017, here, and can click here for a video about the special issue. 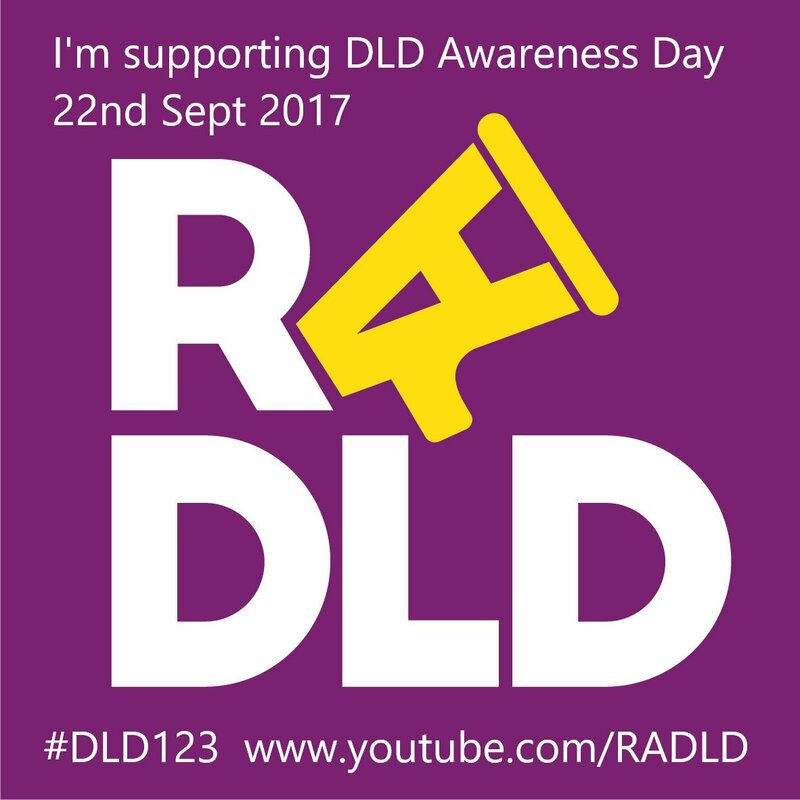 To honour the occasion, and to show support for this important day, Speechwoman's site of the month for September 2017 is the RADLD Campaign in YouTube. The videos are here, and its Twitter handle is @RADLDcam. August 20-26 is Speech Pathology Week 2017 in Australia, mounted by Speech Pathology Australia and supported by its members. The theme of #SPweek this year is Communication Access, and this excellent vido/animation was produced as a plain English explanation, with relatable examples, of what Communication Access is. Watch, learn and enjoy! The Speech Assessment and Interactive Learning System is an app-based tool for presenting children with recordings of other children's speech. The recordings represent children's efforts to perceive difficult sounds, some articulated correctly, some misarticulated. The child's task is to determine if each auditory stimulus is a correctly articulated variant of the target word. Four published studies have shown that a child's rate of progress in speech therapy will be double the usual rate if the program is included as part of a typical speech therapy program. This is an archive of the MUSEC Briefings on educational and clinical interventions for children with developmental disorders. Debunking pseudoscience, and pointing the way to evidence-based interventions. The files have been saved there because Macquarie University will close the Macquarie University Edication Centre soon, and the Briefings page will be taken down. The last two files, marked Text, in the series are identical and include the references for all the Briefings (two copies were made just in case). The Briefings are also available in the Wayback Machine (see the May entry below) e.g., February 2017 snapshot). Internet Archive Wayback Machine: If a website, or web page, you value has disappeared from the Internet, you may be able to find it here by entering the URL (web address) and searching. It's a treasure trove! How exciting! In April 2017 Speech-Language Pathologist Marleen Westerveld, PhD, CPSP launched her nicely designed site, which she describes as a work in progress. The resources it contains so far include spontaneous language elicitation tools and child language intervention programs. Speechwoman plans to keep an eye on it as it develops; you might want to, too. Speechwoman is not the only one who eagerly awaited the ReST Rapid Syllable Transition Training (intervention for children and young people with Childhood Apraxia of Speech or CAS) website, launched this month under a creative commons licence. This outstanding site comprises (1) a self directed learning package for SLPs/SLTs and students to learn how to deliver ReST treatment to children with Childhood Apraxia of Speech (CAS) with plenty of video-footage of real children involved in intervention; (2) information for parents and the general community; and (3) details of the research evidence that underpins ReST. The ReST treatment was developed via research studies that showed that when it is delivered as it was designed, the speech accuracy of children and young people with CAS can be improved. Details of the research can be found on the research tab. The "ReST Team" would love to hear from SLPs/SLTs and students who use the site, and families whose children have benefited from the therapy. Anyone interested in Aphasia, difficulties with speaking, writing and understanding language, and a condition that many people experience after they have had a stroke, will want to see the excellent videos that British Speech and Language Therapist Abi Roper has posted to her informative and easily navigable website. Abi is conducting her doctoral research at City University of London in the Division of Language and Communication Science (Adult Assessment and Intervention of Language and Speech Disorders Group, here). Don't miss the audio and videos on the conferences and talks page, where there is actually some talking! 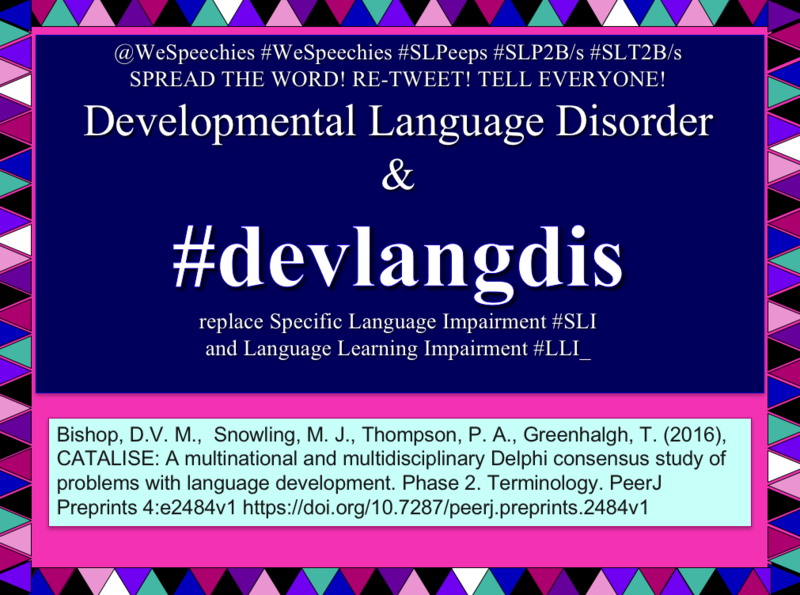 Speechwoman has caught the #DevLangDis PROMOTION BUG, and experts agree that it may take a long time for her to recover. Speechwoman's ends the year with three deeply personal and insightful blog posts by parents: Kathleen Wyant's How it feels to have a 3-year-old with speech delay, Melissa Lilly's The truth about being a mom with a speech delayed child, and Meriah Nichols's 10 Easy ways to show you are cool with special needs and disability on the Scary Mommy site. Thanks mommies. Established in 2010, "this blog is maintained by the Language and Working Memory Laboratory at the University of Western Ontario. The purpose of this blog is to review research articles and discuss clinical implications." "Did you know that that up to 90% of a child’s brain development happens in the first 5 years? ...When babies and children get what they need – it can have a lasting effect on their future. Sharing stories, rhymes, singing, talking and playing with your child from birth builds a foundation for your child’s future development that can last a lifetime." A resource-rich project of the State Library of Queensland that includes practical tips for parents. Free to download under a Creative Commons license, Words of Wisdom is a book by early-career researchers for early-career researchers. Edited by GYA members Rob Jenkins, Jan-Christoph Heilinger, and Anina Rich, the book contains advice of academic mentors to early-careeer scientists. Congratulations on this inspiring initiative, Global Young Academy! Start here where Dr Strand talks about the excellent work of CASANA, and the other videos will follow automatically. They are: Other Resources, How can parents help with CAS?, Treatment of CAS, Diagnosis of CAS, Differential diagosis, Definitions and descriptions of CAS, Possible causes, Levels of severity, and CAS Information for Parents. This is a wonderful resource for families and clinicians. This month, Speechwoman celebrates new, improved versions of websites that have been around for a while: the RCSLT's Giving Voice site, and Speech Pathology Australia's site. The Giving Voice campaign aims to "give voice" to people with speech, language and communication needs – to ensure their requirements, and those of their carers and families are met. Its focus is on demonstrating how speech and language therapy can make a difference to individuals, and the broader society, across the UK. Follow its Twitter handle: @GivingVoiceUK. Speech Pathology Australia is a national organisation with state and territory branches. Each branch has a hard-working executive that comprises volunteer speech pathologists from a range of settings: academic, disability, education, health, and private practice. Branches provide a forum for the discussion of issues relevant to the speech pathology profession, and peer support and networking opportunities. One of the great strengths of this small (approaching 7,000 members) but active organisation is its continuing professional development (CPD) program. Its Twitter account is @SpeechPathAus. Consider these statements: "Children need explicit instruction in the five essential components of reading in every classroom, every day" and "This should begin in the foundation year of school, when most children turn five years old". Like a lot of proclamations that are underpinned by years of serious science, they are not going to catch-on as slogans, but Speechwoman hopes that the principles they represent will be embedded in education policy and practice, soon, if not sooner. Read about the five keys to reading (PA, phonics, fluency, vocabulary and comprehension), what you can do, as a teacher, principal, parent, or policy maker, and bookmark the publications listed on the site. Speechwoman recommends: "Read about it: Scientific evidence for effective teaching of reading" (68-page pdf). What a delight! Professor Susan Rvachew of the School of Communication Sciences and Disorders at McGill University in Montreal, speaks thoughtfully and enthusiastically, for just four minutes, about the rewards of blogging and Twitter for professional purposes. Follow her on Twitter here, and read her excellent Developmental Phonological Disorders blog (Speechwoman's pick in October 2012) here. It is good to know that the second edition of her 2012 book, with Françoise Brosseau-Lapré, is on its way. This month, Speechwoman's pick is an open access journal article by Professor Pamela C. Snow. This paper is concerned with the fundamental and intrinsic links between early receptive and expressive oral language competence on the one hand and the transition to literacy in the early school years and achievement of academic (and life) success on the other. Consequently, it also concerns the professional knowledge base of two key disciplines whose work is central to children’s early language and literacy success: teachers and speech-language pathologists (SLPs). Oral language competence underpins the transition to literacy, which in turn underpins academic achievement. Academic achievement is significant in its own right, conferring opportunities for further education and training post-secondary school, contributing to psychological health and mitigating some of the mental health risks and adversities that can be associated with adolescence and early adulthood. The central thesis is that the linguistic basis of the transition to literacy makes early reading success core business for SLPs. Further, SLPs need a firm grasp of the political and ideological factors that have exerted historical and continuing influence on reading instruction in western nations such as Australia, the US and the UK. This will facilitate the establishment of meaningful working relationships with teaching colleagues, to achieve optimal education outcomes for all children. Snow, P. C. (2016). Language is literacy is language. Positioning Speech Language Pathology in education policy, practice, paradigms, and polemics. International Journal of Speech-Language Pathology, 18(3), 216-228. This is an interactive tool to help (mainly Australian) students who are studying introductory phonetics. It provides a range of visual and aural resources to build on, irrespective of the textbook being used. Each section contains information and interactive displays. Authored primarily by Nick Reid, this is a web based version of an old 2004 favourite of Speechwoman's that originally called a CD-ROM home. Malcolm Abel did the Authorware programming, and Ross Hinkley produced the original graphics for the CD, while Dr Helen Fraser authored the section on Acoustic Analysis. The people involved in the 2014 web-based version were Raphael Roberts (web design and programming), Patricia Donald (graphics); and content contributors to included Patricia Penfold, John Rock, Sukhjinder Khunkhun, and Rosetta Khaebana. As they say in the helpful, no-nonsense phonetics exercises, "Nice, job!" The Research Support Network (ResNetSLT) supports research capacity building, as a key priority action for embedding evidence-based practice and helping experienced clinicians contribute to the professional evidence base. It holds Twitter chats on the #ResNetSLT hashtag, details of which are here. This is the official site of Dr. Barney Glaser and Classic Grounded Theory. "All research is "grounded" in data, but few studies produce a "grounded theory." Grounded Theory is an inductive methodology. Although many call Grounded Theory a qualitative method, it is not. It is a general method. It is the systematic generation of theory from systematic research. It is a set of rigorous research procedures leading to the emergence of conceptual categories. These concepts/categories are related to each other as a theoretical explanation of the action(s) that continually resolves the main concern of the participants in a substantive area. Grounded Theory can be used with either qualitative or quantitative data." "SIL International is a faith-based nonprofit organization committed to serving language communities worldwide as they build capacity for sustainable language development. SIL does this primarily through research, translation, training and materials development. SIL works alongside ethnolinguistic communities and their partners as they discover how language development addresses the challenging areas of their daily lives—social, cultural, political, economic and spiritual." Speechwoman's "most used" resources on this valuable site are the Doulos SIL fonts and the Language and Culture Archives. Highly commended. The NDIS was launched in July 2013, following years of discussion about the need for a major reform of disability services in Australia (history). The NDIS is a new way of providing individualised support for eligible people with permanent and significant disability, their families and carers. ACNR is a UK-based, international, peer reviewed journal which aims to keep busy practicing specialists up-to-date with the latest advances in their fields, including areas of neurology and neuroscience outside their main area of sub-specialty interest. A vast and carefully curated repository of groundbreaking research, news, views and ideas, in communication sciences and disorders. ASHAwire is an indispensable resource for scientists, clinicians, and students that includes the American Journal of Audiology AJA, the American Journal of Speech-Language Pathology AJSLP, the Journal of Speech, Language, and Hearing Research JSLHR, Language, Speech, and Hearing Services in Schools LSHSS, the Journal of Speech and Hearing Disorders JSHD Archive, Perspectives (online periodicals exclusively sponsored by ASHA's 18 Special Interest Groups: SIGs) the CRed Library, and the ASHA Leader. Ffion Lindsay writes, 'A good public speaker takes their audience on a journey, leaving them feeling inspired and motivated. But structuring your speech to get your ideas across and keep your audience engaged all the way through is tricky. Try these eight storytelling techniques for a presentation that wows... Your talk – however dry the subject – can be brought alive if you find the story at the heart of it all. IPA Character Picker v. 14, the work of Richard Ishida, is easy to use and ideal for newcomers to phonetic transcription because of the clarity with which the symbols are set out. The user clicks on the required symbol and it 'jumps' into a text box above. When the transcription is complete, it can be copied and pasted it into a document. Users can click on 'show notes' in tiny text below below the charts to read detailed instructions. IPA Character Pickers joins several other phonetic font pickers that have caught Speechwoman's eye in recent years: Sciweaver's i2speak Smart IPA Phonetics Keyboard whose symbols work fine in Tweets, IPA Palette for Mac by Brian S. ('Moses') Hall (where would Speechwoman be without it!) and the uncomplicated Type IPA Symbols - Phonetic Keyboard. Then there are IPAcharpick from Ruben Schachtenhaufen in Denmark, Portland, Oregon based Weston 'Thunderboy' Ruter's IPA Chart Keyboard, and Typelt from Tomasz P. Szynalski in Poland. May is Better Hearing and Speech Month Each May, the US-and-ASHA-focused Better Hearing and Speech Month (with the Twitter hashtag, #BHSM) "provides an opportunity to raise awareness about communication disorders and role of ASHA members in providing life-altering treatment." The 2015 theme is "Early Intervention Counts." ASHA (@ASHAweb) is the national professional, scientific, and credentialing association for 182,000 members and affiliates who are audiologists; speech-language pathologists; speech, language, and hearing scientists; audiology and speech-language pathology support personnel; and students. The Crosslinguistic Project Phonological Development features the work of B May Bernhardt and Joseph Stemberger at UBC in Vancouver, with fabulous contributions from phonologists and speech-language pathologists worldwide. Take time to view the Webinar videos; explore the (non-linear) phonological assessment and analysis procedures for children with typical or protracted phonological development; engage in some English and Spanish Funology; do tutorials in English and French; and flex your transcription muscles! Lots to see and do: Activities, Features, Tests, and ... well, get on over there and check it out for yourselves, keeping an eye out for the SECRET BONUS FOOTAGE! YourHealthNet, subtitled "Navigating Effective Treatments With Systematic Reviews" is an online toolkit aimed to help site visitors understand and develop the skills to explore health research. Published under a Creative Commons license, it was developed by the Centre for Health Communication and Participation at La Trobe University, with support from the Australasian Cochrane Centre. Although the most recent update to YourHealthNet was as far back as March 2012, the whole site repays exploration. This is Jeffrey Beall's list of questionable, scholarly open-access publishers. He recommends that scholars read the available reviews, assessments and descriptions provided on this helpful and increasingly necessary site, and then decide for themselves whether they want to submit articles, serve as editors, or accept invitations to join editorial boards. The criteria for determining predatory publishers are here and this is the associated blog. 'Science writing is best when it is concise and precise. Good science writing is full of explicit details, devoid of vagueness, and strictly adheres to a narrative. In fact, a good scientific paper has a lot in common with a short story,' writes Edward Davis. Yes! This page on the Raising Children website is crammed with readable, sound advice for parents raising children to understand and speak two languages or more. You can follow Raising Children on Twitter at @RCN_AUS. "Understanding evidence matters for people to play a full and informed role in society. When an animal rights group claims milk causes autism, or a newspaper runs a double-spread on untested cures for cancer, people need to ask for evidence and they need a place to go for reliable and trustworthy information about evidence. Ask for Evidence is starting to light some fires under all sorts of organisations. Product claims have been withdrawn, politicians have apologised and vulnerable patients have been helped." Follow @senseaboutsci, the brains behind Ask for Evidence, on Twitter. The RALLI campaign was created to Raise Awareness of Language Learning Impairments. On its YouTube channel, are videos that explain what a language impairment is, the impact it can have and how to get help. You can follow @RALLIcam on Twitter. Open access articles from the International Journal of Language & Communication Disorders, on unexplained language problems in children. Australian academic Pam Snow describes her wordpress site as, "A blog on child and adolescent language, language competence and social disadvantage, early literacy instruction, youth offending, communication skills and the student doctor...and a few other bits and pieces." It is full of useful information, thoughtful opinion pieces and dry humour. Dually qualified as an SLP and a psychologist, Pam is an Associate Professor in the Department of Psychiatry at Monash University, and mostly lives and works in Bendigo, central Victoria. Her research passion is communication competence - primarily as this pertains to vulnerability in early life, but increasingly as it pertains to how student doctors learn to master the art and craft of interacting with patients in ways that optimise clinical outcomes. As a connoisseur of style with content, Speechwoman loves this blog. Cochrane is a global initiative. The aim of the people behind it is to make the vast amounts of evidence, generated through research, useful for informing health decisions. It incorporates initiatives such as Cochrane producing summaries and translations of Cochrane content, partnering with Wikipedia to improve evidence in Wikipedia health pages, providing free access to Cochrane evidence in low- and middle-income countries, and developing a collection of Cochrane podcasts. Browse the library and enjoy the diverting, entertaining and informative EVIDENTLY COCHRANE blog. A neuroscientist reflects on his experience of studying the circuits that control neural activity while his own brain began slowly failing him. "I am still at the beginning of my fascinating, frightening and ultimately life-affirming journey as a brain scientist with a disabling disease of the brain. Already it has given me a new perspective on my work, it has made me appreciate life and it has allowed me to see myself as someone who can make a difference in ways that I never expected. But it took a bit of time to get here..."
Ever wondered about the science (or lack of) behind interventions, approaches, gizmos and 'methods' like 'Behavioural Optometry', 'BrainGym®', 'Cellfield Program', 'Facilitated Communication', 'Interactive Metronome Training', 'Irlen Tinted lenses and Overlays', 'Learning Styles', 'Picture Exchange Communication System PECS', 'Reading Recovery for Young Struggling Readers', 'The Listening Program®' and 'The Tomatis Method as a Treatment for Autism'? The Macquarie University Special Education Centre (MUSEC) provides a balanced and careful run-down on all of these and more. Good thinking, MUSEC! Founded in 1987, the Bristol Speech and Language Therapy Research Unit provides copious information about, and useful resources related to speech and language development and communication disorders in young children. Pages that caught Speechwoman's eye on her most recent visit were the ones on Specific Language Impairment, and Apps. Nicely done, lots to see, and well done, team! @WeSpeechies (hashtag #WeSpeechies) was founded on March 5, 2014. It provides a curated meeting point, on Twitter, for Speech-Language Pathologists (SLPs), Speech and Language Therapists (SLTs) and SLP/SLT students to promote international professional communication. Its purpose is to facilitate mutual support, helpful connections, sharing of peer reviewed articles and relevant links to websites and blog posts, and opportunities for professional encouragement colleague-to-colleague worldwide, across all areas of practice. In general it has a clinical emphasis with EBP, solid theory and exemplary client care at the forefront. Read more about it here. The Centre for Clinical Research Excellence (CCRE) in Aphasia Rehabilitation is an Australia wide project, funded for five years by the National Health and Medical Research Council (NHMRC). The program seeks to develop the Australian Aphasia Rehabilitation Pathway, a set of guidelines for person-centred aphasia services. This excellent website includes information about the program, the people involved, PhD opportunities and publications. to encourage people around the world to join together to make a difference in the lives of people living with communication disorders and disability. The project has a Twitter presence, with the handle @ICP2014 and the hashtag #ICP2014. The speech accent archive uniformly presents a large set of speech samples from a variety of language backgrounds. Native and non-native speakers of English read the same paragraph and are carefully transcribed. The archive is used by people who wish to compare and analyze the accents of different English speakers. For Speechwoman, the most useful section when working with multilingual children with speech sound disorders is the native phonetic inventory. Wonderful work, Steven H. Weinberger! October is AAC Awareness Month, and Speechwoman's pick for October is ISAAC Australia. AAC? Augmentative and Alternative Communication. Explore this splendid array of free articles to find out more! Ethnologue: Languages of the World is a comprehensive reference work cataloging all of the world’s known living languages. It contains information on 7,105 known living languages. Ideas, events, and inspiration for speech and language therapists, and a presentation for parents. This is a closed Facebook Group where Speech Pathology Australia members share information on Apps, mobile devices and related information. Well-moderated by Sharon Crane, the Association's senior advisor on and manager of Continuing Professional Development (CPD) and Professional Self Regulation (PSR), the group provides a useful member benefit. Drs Trish Hargrove and Nancy McGarr describe their Clinical Prosody blog as a work in progress. Their focus is the evidence-base around therapies concerned with improving prosody, and those that use prosody to improve other aspects of communication. Site visitors should be sure not to miss the continually updated anotated bibliography. The Communication Trust's What Works database provides information for SLTs/SLPs on some 60 evivence-based intervention approaches to children's speech and language difficulties. Explore it in detail! Elsevier provides a series of helpful webcasts and a view-on-demand podcast on how to review a manuscript. ...speaks for itself! For every Roman character you type, a popup menu displays a group of phonetic symbols to choose from. For example, if you type "a" one of the suggestions is /æ/ and if you type "t" the suggestions include /t/, /ð/ and /θ/. Use arrow keys to select the required symbol and press Enter. There are several keyboard options including a SAMPA (Speech Assessment Methods Phonetic Alphabet) keyboard. It lets you type phonetic symbols using Roman characters according to SAMPA rules. Alison Clarke, a Speech Pathologist in Melbourne, has produced this engaging, informative and important 15 minute video. She explains the science behind the best way to teach literacy, explains why it is not happening in many schools today, and why Australian children achieve remarkably poor test results when compared with children in the rest of the English-speaking world. But that's not all! Citing contemporary research, she suggests what can be done to help change this. Take half an hour to listen and watch twice! Here is the pdf of the Teaching Reading report, complete with recommendations, mentioned in this excellent presentation. Dr Sally Bates (University College Marjon, Plymouth) and Dr Jocelynne Watson (Queen Margaret University, Edinburgh), have developed this new charting and analysis tool. It is free to download, under a creative commons license, from www.qmu.ac.uk/ppsa.The PPSA incorporates elements from both process and contrastive analysis and is designed to provide the clinician with an easily interpretable, at-a-glance overview of a speaker's phonological strengths and weaknesses, so supporting principled clinical decision making and outcome measure. What a delightful way for Speechwoman to start her 16th year of selecting sites of the month! This is Speechwoman's final 'pick' for 2012, and what an amazing site it is! This freely accessible online resource is for SLPs/SLTs worldwide who have children who are learning to communicate in more than one language on their caseloads. The site includes The Multilingual Children with Speech Sound Disorders: Position Paper, information for over 40 languages, speech assessments, and a parent report measure entitled the Intelligibility in Context Scale. Developed by Sharynne McLeod and colleagues at Charles Sturt University, with contributions by fonoaudiólogas / logopedas / logopedists / logopédistes / orthophonistes / patóloga de habla y lenguaje / speech pathologists / speech-language pathologists / speech therapists / and speech and language therapists from around the world, the Multilingual Children's Speech site is a great credit to all concerned. Wonderful! Merveilleux! ص.رائع, مدهش, عجيب, بديع , Wunderbar! Admirável! Дивовижний! Portentoso! Asombroso! Harika! Fantastisk! Ka rawe! Adori! Rhyfeddol! Speechwoman celebrates the official blog of the American Speech-Language-Hearing Association on the occasion of its first birthday by choosing it as her site of the month for November 2012. Woohoo! The goal of ASHAsphere, also featured in Webwords 44, is to inspire discussion of issues pertinent to audiologists and speech-language pathologists. Usually interesting, always relevant, and never taking itself too seriously, it features posts from communication sciences and disorders professionals, ASHA staff and staffing and recruitment specialists. ASHAsphere welcomes applications from writers who aspire to be ASHAsphere bloggers. Susan Rvachew writes: 'Welcome to my blog which is intended to contain two kinds of posts: occasional postings on topics related to phonological development and disorders or any topics that seem of interest to me and relevance to the speech-language pathology community (these will appear on the front page; other pages will be specifically related to the book “Rvachew, S. & Brosseau-Lapre, F. (2012). Developmental Phonological Disorders: Foundations of Clinical Practice. Plural Publishing.” and will be a sort of diary of my experiences teaching from the book for the first time in the coming academic year ...'. Good reading! Hosted by Spectronics, the conference once again focused specifically on technologies designed to advance independent achievement for people with disabilities and/or students with learning difficulties. The sessions were organised into three streams: Struggling Students, People with Complex Communication Needs, and People with Disabilities. The page contains many resources including slideshows and handouts. There is also a page devoted to the conference videos. Reviewers play an essential part in science and in scholarly publishing. Scientists and scholars rely upon peer review to validate research, engage other specialists in the support of submitted work, and increase networking possibilities within specific specialist communities. Elsevier, like most scientific publishing companies, relies on effective peer review processes to uphold not only the quality and validity of individual articles, but also the overall integrity of the journals it publishes. Check out a growing accumulation of helpful resources for peer reviewers. Happy 2nd birthday and congratulations Speech Techie, Speechwoman's site of the month winner for March 2012. Blogger Sean J. Sweeney, CCC-SLP has developed a readable, interesting and useful resource. He is more than fulfilling his self-prescribed brief to post resource "through the language lens", or with an eye to how the particular website or program would be helpful in speech and language interventions. There is lots to discover on this site (and here) for SLPs, ESL/ELL teachers, language arts teachers, special education teachers, and anyone who loves words! Brian Goldstein's excellent article about Evidence Based Practice and the PECO Procedure. SLP Mirla Raz writes, "I'm far from a tech geek or someone who has to have the latest electronic device, but when the iPad first came out I wanted one. Maybe I thought it would be a fun personal toy. Who knows? What I didn't expect was that it would have the potential to be a game changer for speech pathologists. A year later, I am convinced that this device will change the way we deliver services." Sharynne McLeod is Professor of Speech and Language Acquisition at Charles Sturt University. She was awarded an Australian Research Council Future Fellowship (2010-2014) titled Speaking my Languages: International Speech Acquisition in Australia. This blog was designed to archive what she learned and accomplished during the Fellowship. The original post provides details about the Fellowship. Very interesting and informative, thank you, Australian Bureau of Statistics. This ticks all the boxes! Thank you for Praat too, Sidney Wood! Still in a phonetics mood, Speechwoman has chosen May 2011 to celebrate Jennifer Smith's industry and thoroughness in putting together this comprehensive and nicely organised list. Everything to do with phonetics...everything! So much so that even Speechwoman now knows that Jul'hoan, a language spoken in Namibia, has four tones, 30+ vowels and 89 consonants (including 48 clicks) in contrast to Hawaiian with eight consonants and just five vowels. Speechwoman begins 2011 with two winning websites, both of which relate to children who stutter and how stuttering makes them feel. This is a book for four to nine year olds by Karen Hollett, a person who stutters. When her family moves to a new town, second grader Aiden becomes worried about how her new classmates will react to her stutter. At first, Aiden tries to hide her stutter from the other children. This makes her very sad. But soon, with a teacher's help, Aiden learns that it’s OK to be herself, and OK to stutter. This title is available from Mighty Book as a free online flash-animation story for children on either side of the teasing equation. Ridiculed about his stuttering, Stanley the squirrel refuses to reveal that his feelings are being hurt, until he learns an important lesson from a thoughtful friend. Turn your computer's sound on so that you can listen to and read the story. Congratulations to January's joint winners! Contemporary Issues in Communication Sciences and Disorders (CICSD), the biannual, peer-reviewed journal of NSSLHA, became an online-only, open-access journal in spring 2010. Lucky readers! The Canadian Journal of Speech-Language Pathology and Audiology is a scholarly journal published four times a year by the Canadian Association of Speech-Language Pathologists and Audiologists. The purpose of the Journal is to disseminate contemporary knowledge pertaining to human communication and related disorders. CJSLPA covers both applied and basic research, reports of clinical and laboratory inquiry, as well as educational articles related to normal and disordered speech, language and hearing in all age groups. The archive contains every issue of CJSLPA and its predecessors from 1973 to date, all freely available to download (as individual articles or as entire journal issues). Speechwoman can't stop reading, and is very impressed! Founded in 1972, NSSLHA is the national organization for graduate and undergraduate students interested in the study of normal and disordered human communication. It has a range of publications and its journal, Contemporary Issues in Communication Science and Disorders, provides many well written, interesting and informative articles by up-and-coming "new" researchers. While on the NSSLHA site, check out the EdFind search engine for students seeking an appropriate academic program in Communication Sciences and Disorders at the master's or doctoral level, and the survival guide for CSD students! PhonoComp is your source for the Hodson Computerized Analysis of Phonological Patterns (HCAPP) and the book, Evaluating and Enhancing Children's Phonological Systems, both by Barbara Williams Hodson, PhD. This IPA keyboard allows you to type pronunciations of English words. There are keyboards on this site for ten other languages. The ENNI is an assessment tool for collecting language information from children aged 4 to 9 through storytelling. Pictures that portray a story are presented to a child, who then tells the story to the examiner. Picture sets were drawn for the ENNI by a professional cartoonist; they range from a simple story with 2 characters to a complex story with 4 characters. Local normative information was collected from 377 children in Edmonton, Alberta, Canada. Norms from this sample are included for a number of analyses. Established in 1988, The National Institute on Deafness and Other Communication Disorders (NIDCD) is one of the Institutes that comprise the US National Institutes of Health (NIH). The goal of NIH research is to acquire new knowledge to help prevent, detect, diagnose, and treat disease and disability. WordNet® is a free downloadable lexical database of English whose development has been directed by George A Miller, celebrated as one of the instigators of modern cognitive psychology. Words are grouped into 'synsets' that express distinct concepts, and these synsets are interlinked according to conceptual-semantic and lexical relations. The interlinked network can be navigated with WordNet's browser. It is a valuable tool for computational linguistics and natural language processing. Learn about the Global WordNet Association too. It's all very, very interesting. Without doubt, Speechwoman knows promise when she sees it! So she's keeping a close eye on J&R Publishing Services who offer researchers and academics in human communication science a platform for publishing their works. Her tip is that this new company is going to be a winner in the skilled, experienced hands of Jim and Rachael Wilkie. Authors, if you have an SLP/SLT manuscript up your sleeve, or a terrific book idea, contact J&R Press. They have much to offer! The National Acoustics Laboratory is a division of Australian Hearing. Its LOCHI "outcomes study" aims to examine, longitudinally, the development of children who have been identified with hearing loss in the Australian states of New South Wales, Victoria and Queensland. In its first phase the study focuses on development up to 5 years of age. This small but highly informative, family-friendly and interesting site includes research papers, clinical tools and newsletters. The LOCHI team also provides, as downloads or via email, copies of the PEACH and CDI assessments in a range of languages: Arabic, Chinese, English, Japanese, Turkish and Vietnamese. UK based Speech & Language Therapy in Practice is an immensely readable quarterly print magazine "written by therapists for therapists". Each issue includes how-to articles, clinical reports, low cost ideas, reflections, opinions, discussion and debate (much of it around EBP), advice from a life-coach, and book, materials and other reviews. The mission of the magazine is, "To be the most inspirational, essential and practical resource for speech and language therapists in the UK". It has its own web site with a members' only section, a presence on Facebook and the editor Avril Nicoll's blog. As well as being a skilled editor Avril has a lively and engaging writing style, so it comes as no surprise that her blog is interesting, informative and entertaining. The Speechmag blog has been recognised with the first Speechwoman award for 2010. Visit the Apraxia Walk Headquarters, no matter where you are in the world and register by October 5 to participate (and get the T-shirt!). "If you are interested in applying as an International Affiliate, you must hold a master's degree or the equivalent. * International Affiliation with ASHA is open only to persons who reside abroad and who are not exclusively citizens of the United States. Dual citizens may also become International Affiliates as long as they reside outside of the United States. You should be aware that International Affiliates are not eligible for and do not hold ASHA's Certificate of Clinical Competence. You must also agree to abide by an ethical code of professional practice statement which prohibits use of affiliation with the American Speech- Language-Hearing Association in the promotion of commercial products. SLPath is the brainchild of Jennifer Taps, M.A., CCC-SLP. Jennifer facilitates the Articulation Resource Center for the San Diego Unified school district, supporting 250 SLPs in phonological and articulation treatment. Online for about a year, the site is a work in progress (as all the good sites are!) full of helpful child speech related resources and information. Nice work Alex, Zoe and Jen! The LORS Project was conducted in 2005-2007 and explored issues in identifying, defining, collaborating and reporting on literacy outcomes for students and the implications for speech-language pathologists’ role in early literacy. This project highlighted the requirements of the workplace as a key factor in the roles that SLPs take within schools and how SLPs report the results of their work. Many materials are provided free in return for appropriate acknowledgement of the the LORS Project. Launched in 2007, the Encyclopedia of Language and Literacy Development forms a component of The Canadian Language and Literacy Research Network web site. The people behind this online, free encyclopedia hope to help provide answers to questions about children's language and literacy by providing information based on relevant and up-to-date research that is presented in an easily accessible format. An interesting feature of the site is its hyperlinked listing of the ten most popular articles. This is already an outstanding resource that promises to improve with age. If, for ANY reason, you have an interest in stuttering (stammering) check out the 11th online stuttering conference. This is a wonderful month-long learning opportunity, and 'communication opportunity' for people who stutter, their families and employers, the professionals who work with them, students in training and their instructors. With Chapters in 14 countries, and members in 50 other countries, ISAAC supports and encourages the best possible communication methods for people who find communication difficult. ISAAC's vision is for everyone in the world who could potentially communicate more easily by using AAC to be able to do so. To make this a reality, people who use AAC, their families, therapists, teachers, researchers, people who make equipment, and people in governments will have to collaborate and cooperate. This excellent, accessible and practical web site helps make such communication possible. Well done ISAAC! This is an interesting and helpful mini-site by Sharon Glennen, PhD which is designed to provide answers to the many questions parents and professionals have about language learning following international adoption. We don't hear enough about language acquisition in older children generally, so this is very, very interesting! So eager was Speechwoman to explore the Conferences Presentations and Reference Lists on this deceptively low-key looking but content rich site that she nearly sprained her typing finger again (the last time was in 2006, you may recall) and the people left her awestruck. "While most girls my age have boyfriends, go out every weekend and can start a can start a conversation without even thinking about it, those things are like running a marathon for me. "Lizzie aged 20 combines two talents. One, she is an outstanding in-line hockey player competing at state and national levels, and two, she is a very good writer, as her nicely constructed and well expressed article in Girlfriend Magazine shows. Speechwoman has broken with tradition this month, dusted off the scanner, and uploaded Lizzie's insight-producing article about being a young woman diagnosed with Asperger Syndrome (AS). Not many females have AS, and it is good to see this terrific piece that demonstrates in no uncertain terms that, "even if you are different you can still do things." Well done Lizzie! ELCISS aims to enhance language and communication in secondary school children with primary language and communication impairment through narrative and vocabulary enrichment. Victoria Joffe, who claims responsibility for the site's pink and purple colour scheme, is the primary investigator on the ELCISS research project funded by the Nuffield Foundation. The witty illustrations by Peter Hudspith and the clever web design by Cato Hoeben are a joy, and the advisory group impressive! Each month the UK organization the National Literacy Trust, offers a perspective on current issues affecting literacy and education policy and practice. Its website is resource rich and includes a collection of very good photocopy free handouts on fostering speech and language acquisition, and all topics are listed here. If your baby has a hearing loss, it is important to catch it early. "Babies begin to develop speech and language in the earliest months of life. If families know about a baby's hearing loss, much can be done to encourage communication development." Sensible, practical advice and information about newborn hearing screening and what to do if your baby is diagnosed with a hearing loss. Professor David Crystal is one of the world's foremost experts on the subject of language. In 1995, he was awarded the Order of the British Empire for services to the English language. Visit his web site and blog. This website is designed to provide support and information to those seeking information about a rare speech disorder called foreign accent syndrome (FAS).Congratulations William Katz and Diane Garst of the Speech Production Lab University of Texas at Dallas! Put phonetic symbols into your Word documents - easy! And check out the index Fun, UCL! The Children’s Hospital Education Research Institute (CHERI) is a unique research institute that aims to improve the interface between children’s health and their education. CHERI was established in 1996, in association with the University of Western Sydney, University of Sydney, NSW Department of Education and Training, and the Catholic Education Commission of NSW. CHERI is a highly regarded and nationally recognised institute that conducts research into the educational and psychosocial aspects of children with learning problems. In addition, the CHERI team conducts educational assessments for some of these children who also have a genetic or chronic condition such as neurofibromatosis type 1 (NF1), velocardiofacial syndrome (VCFS) and attention deficit hyperactivity disorder (ADHD). CHERI also provides information and resources to families and professionals through its conferences, research forums, and helpful information sheets. Speechwoman could not wait to make amends upon realising that John Higgins' endlessly useful masterpiece had never received her site of the month award! Minimal pairs are pairs of words whose pronunciation differs by one segment, such as sheep and ship orlice and rice. Beloved by Speech-Language Pathologists/Speech and Language Therapists everywhere, they are often used in phonological therapy, phonemic awareness activities, auditory discrimination exercises, and in EFL contexts, pronunciation exercises. Use John's meticulously cross-referenced tables of vowels and consonants to retrieve relevant lists of pairs for your clients. Conveniently, all of the lists are plain ASCII text files. They are easy to use, and invaluable. When you visit this unpretentious site, check out the homophones, homographs and more. The International Directory of Communication Disorders is an inspirational database on international issues related to communication disorders. The information is offered as a community service to persons in the professions; it is free, and available for use for any non-commercial purpose. This is the long-awaited companion web site for Australian Speech-Language Pathologist Carmen Fernando's helpful book about ankyloglossia, published in 1998. Reflecting one skilled professional's tireless dedication to, and opinions, observations and expert experience of this common but under-researched congenital condition, this developing site presents a range of useful information and resources for (and by) professionals, and for the families and individuals they serve. The UK-based Targets and Activities Project (TAP) website has been set up to allow Speech and Language Therapists, Language and Communication Teachers and others to share ideas with those working with children with communication difficulties in schools and other locations. On the TAP site are activities sheets for working with children at a variety of different levels and across a variety of curriculum and skill areas. The site uses the P-scales and the lower levels from the National Curriculum as a means for organising these documents in a way which should make them easy to find. These documents use a simple standardised format to make them easy and quick to read. TAP sheets are especially designed to be used by education staff - such as learning support assistants - who have had guidance from the appropriate specialist. The International Association of Logopedics and Phoniatrics (IALP) is a non-profit, non-political and nongovernmental, worldwide organisation which works for the benefit of persons with speech, language, voice, swallowing and hearing disorders. The Organisation was established in 1924 and has two major subfields, logopedics and phoniatrics. IALP aims to help clinicians around the world to improve the treatment of people with communication disorders. Nicenet's Internet Classroom Assistant (ICA) allows virtually any classroom, even those with modest resources, access to powerful tools. Everything in Nicenet is offered free for public use, and Nicenet makes no profits from your participation. It is ideal for journal discussions, document development and a range of teaching and continuing professional development activities. Research programmes at CanChild concentrate on children and youth with disabilities and their families within the context of the communities in which they live. The focus is on the interrelationships between individuals, their families, communities, and health systems. The focus of research conducted by CanChild is broad, and includes children and youth with physical, developmental, and/or communicative needs who require rehabilitation services, as well as their families. The contents of this site come largely from Jean Peccei's handouts and lecture notes for courses she has taught, or currently teach, in the English Language and Linguistics Programme at Roehampton University. A very nice range of information and resources fro newcomers to the study of child language. The EARTHSPEAK people build parent speech training programs that aim to complete the job that cleft palate surgery begins. Parents and other lay people, irrespective of their literacy levels, are taught to help their children gain a quality of life previously unavailable to them in a range of countries outside the industrialised world. The NCVS scientists, clinicians and teachers study human voice and speech. Working collaboratively, and representing backgrounds in vocal performance, computer science, speech-language pathology, physics, medicine and other disciplines, they are in a strong position to create comprehensive, cohesive voice and speech investigations. The team strives to communicate and engage with aspiring investigators, voice and speech practitioners, and the general public. The Master of Science in Medical Speech-Language Pathology (MedSPL) at the University of Washington is one of only a few of its type around the world. The program is distinguished by its innovative third year, which includes the Clinical Fellowship, qualifying students for ASHA’s Certificate of Clinical Competence (CCC). MedSPL students will learn to approach speech-language pathology as clinical scientists, using methods grounded in evidence-based practice and the clinical literature. Augmentative Communication Inc. publishes resources that help keep busy professionals and individuals with complex communication needs up-to-date on important developments in AAC. ACI is also a partner in the Rehabilitation Engineering Research Center on Communication Enhancement (www.aac-rerc.com). Clearinghouse for information on the use of computer related technology for children with learning disabilities. This site is devoted to the Appraisal framework, an approach to exploring, describing and explaining the way language is used to evaluate, to adopt stances, to construct textual personas and to manage interpersonal positionings and relationships. Taking the form of an introductory course, the materials on the site include a step-by-step guide to using Appraisal in critical text analysis. The Appraisal framework is an extension of the linguistic theories of M.A.K Halliday and his colleagues (Systemic Functional Linguistics - SFL) and has emerged over a period of almost 15 years as a result of work conducted by a group of researchers led by Professor James Martin of the Linguistics Department of the University of Sydney. The creator and manager of voice & speech source, Eric Armstrong in Canada, welcomes you to this new incarnation of his dream child. He also helps you navigate the site, and introduces you to some of the highlights. FRIENDS is a national organization in the US created to provide support for children and teenagers who stutter, their families, and the professionals who work with them. You lucky dog! Or so says Dr Thomas McIntyre, the author of this eclectic site which offers THOUSANDS of tips on managing student behavior, and provides step-by-step directions for implementing a great number of standard interventions. It also contains a bulletin board on which you can post your disciplinary concerns and receive suggestions from teachers around the world. The Asperger's Association of New England (AANE) is made up of individuals with Asperger's Syndrome (AS), their families, friends and professionals. The group is dedicated to improving the quality of life for people with AS and related conditions, and its mission is to foster awareness, respect, acceptance, and support for these individuals and their families. Speechwoman has been using the Nuffield Centre Dyspraxia Programme since 1985, and she is extremely excited about the latest version. You can download an order form from this site, and send it to the publisher. The babe intends to keep an eye on this embryonic web site, and looks forward to the promised sections of the site that include: frequently asked questions, background information about the programme, links, and information for parents. Note that this review relates to the NDP 2004 Web Site, and not to the programme itself. Vocal problems are common — about 10-20% of all children and 7% of all adults have voice disorders at any given time. The incidence for teachers alone is higher — about 15%. In fact (brace yourself!) according to a study cited on the Voice Academy site, teachers are 32 times more likely than individuals in other professions to be dogged by persistent and incapacitating voice difficulties. Amazed by this statistic, Speechwoman could not wait to sign up for free membership and a whirlwind tour of this fascinating interactive site, complete with audio samples, videos, and animations. The site includes a text only version, a comprehensive glossary of voice related terms, an outstandingly good section for SLPs leading in service events for teachers, a Media Kit, and a great FAQ - all aimed at teachers keeping their voices in fine fettle. Speechwoman, conserving her voice, is curbing an impulse to holler, "Sign up today! This is a web site from McGraw-Hill Higher Education, providing links from "Language", Chapter 6 of Principles of Human Neuropsychology by G. Dennis Rains, Kutztown University of Pennsylvania. The chapter overview is here and there are flashcards too for this and every chapter! Use the drop-down menu on the left of your browser to explore all 15 chapters and the epilogue. There are a few too many dead links among the treasures on this links page, but it is worth persisting, and the rest of the book is easy to navigate definitely repays exploration. Congratulations Clive and Carol, David, Bunt, Grant, Betty, Marilyn ... Bev Dodd, and friends. The Canadian Association of Speech-Language Pathologists and Audiologists (C A S L P A) / Association canadienne des orthophonistes et audiologistes (ACOA) is undergoing a remarkable transformation. Information about the professions, available in French and English provides a good starting point for newcomers to the site. Very nice! This service of the US National Library of Medicine (here) and the National Institutes of Health (here) provides general overviews of speech and language impairments, as well as information, and leads to information, about clinical trials, diagnosis, research, specific conditions and a wealth of other resources. Importantly, it includes a link to MEDLINE where you can search for recent research articles on Speech & Communication Disorders . If you are a speech and language professional with a couple of hours to spare, explore this site in detail to familiarise yourself with what is there. Then you can refer to efficiently it when you need vital information. Voices past and present are included in this amazing sound archive. It is arranged in six sections (so far). The first comprises classic speeches and interviews in the area of stuttering; the second, excerpts from a 1968 panel discussion on "recovery" from stuttering; the third, a 1977 panel on the same topic; the fourth, a 1984 tribute to the life and work of Joseph Sheehan; the fifth, a 1996 panel on "recovery"; and in the sixth, various philosophies and treatments are explained and demonstrated via tapes dating back to 1975. In sum, the archive constitutes a wonderful, dynamic and fascinating work in progress. Congratulations Minnesota State University, Mankato technical staff (especially Christian Andrew Dinger and Agnes Lumenta), Bill Fabian from Australia, and the indefatigable Judy Kuster. Tufts University hosts this directory that evaluates, describes and provides links to hundreds of sites containing child development research and practical advice. Topics are selected on the basis of parent recommendations; they cover all ages, from early child development through adolescence. Selected sites have the highest quality, parent friendly, child development research. Supercourse is a repository of lectures on global health and prevention designed to improve the teaching of prevention. Supercourse has a network of over 56000 scientists in 174 countries who are sharing for free a library of 4875 lectures in 31 languages. Paul Brians is Professor of English at Washington State University. Explaining why he focuses on the common errors in American English Professor Brians says it is because "I'm an American, my students are mostly American, most English-speaking Web users are Americans, and American English is quickly becoming an international standard". Aware that not everyone agrees with him, Paul Brians invites discussion and input from his site visitors. Paul ("don't call me Brian") is reworking the site to take note of American deviations from standard British practice, noting that, "the job is complicated because Canadians, Australians, and many others often follow patterns somewhere between the two". Helpful for anyone who is not American, wanting to publish in American journals. The Starfall site will delight the Phonological Awareness (PA) enthusiast! This method of teaching children to read is partly based on NICD research and incorporates PA activities, sound-spelling (sound symbol) relationships, and phonic skills. "I CAN are the experts in helping children with communication difficulties. If we find and help these children and their families, we can unlock their potential." Pat Mervine ably maintains speakingofspeech.com, a resource rich commercial and informational web site, with an exciting collection of free-for-all downloads in the materials exchange section and numerous message boards and links. The slogan for the Fifth International Stuttering Awareness Day Online Conference is Don't Let Stuttering Stop You ... from creating the life you want in relationships, academics, professional development and personal fulfillment. The conference is open to all comers and runs from October 1 to 22, after which it will remain online with the previous four ISAD conferences. Good news! Conference convenor and co-chair (with Michael Sugarman) and web-whizz Judy Kuster will be honoured next month when she becomes a Fellow of ASHA. Peer recognition - that's really special. And the thumbs up from Speechwoman is pretty nice too! Hats off to Jennifer Gan, a multi-talented Speech Language Therapist, who single-handedly produces and maintains the SHAS web site. This attractive, well constructed association home page contains clearly explained, and interestingly written information for consumers, professionals and prospective SLT students. The site map enables easy navigation, leading visitors to sections on working as a speech therapist in Singapore, an employment FAQ and an outline of the linguistic and multicultural issues clinicians take into account in the Singapore work setting, as well as information about accessing publicly funded and private practice services. A Professor at the University of Vermont, Michael Giangreco's professional and research interests encompass the why and how of planning, adapting, coordinating, implementing, and evaluating educational programs and services for students with disabilities who are included in general education classrooms. His recent work on inclusion, paraprofessional support for students with disabilities, COACH, creative problem-solving and VISTA are featured. Watch out for project evolve, don't miss this and this, and explore in detail - there is more to this site than meets the eye! The SRCLD was initiated in 1980 to provide a forum for the presentation of recent research and the discussion of current issues among established scholars and students in child language disorders. It is organized by a committee of doctoral students from several departments at the University of Wisconsin. What a wonderful transformation! Webmaster Tristán White has made a magnificent job of revising and expanding the RCSLT web site. The RCSLT is the professional body of and for speech and language therapists (SLTs) in the United Kingdom and Ireland, and their new site will repay detailed exploration by consumers, students and professionals. This appealing site has been designed to share information about early speech development and to provide examples of the delightful speech sounds that children produce before they say words. Visitors are invited to learn about and listen to vocalisations from different developmental levels; check their listening skills; and discover ways to stimulate early speech development and oral language. "Enhancing teaching and research in Speech and Hearing Sciences through collaboration with clinical and research communities using innovative communication technologies." This is a "must see" site for anyone interested in social communication and AAC. Vicki Blackwell, Technology Resource Teacher, Tangipahoa Parish School System provides, among MANY other resources, tutorials on web design, using PowerPoint in educational settings, and searching for information on the web. This is a magnificent starting-place for beginners in these matters. Allow a couple of hours to familiarise yourself with what this outstanding site has to offer. In this instance it is the web weaver and not just the site itself that is SLP related - Vicki's sister is a Speech-Language Pathologist. Judith Felson Duchan is an emeritus professor from CDS at the University of Buffalo. She is in the process of putting together this fascinating history of the profession in the US. While you're on Judy's site, check out her insightful Golden Rule article, her Medical Model graduation speech (wish I'd been there) and her amazing career. Inspirational Judy! The Practice GONE Hearing that The Practice was Site of the Month for April 2001, Speech Language Pathologist and funny woman Jenny Loehr, MA CCC/SLP marked the occasion by sending this cartoon! Afasic is a British charity that represents children and young adults with communication impairments, works for their inclusion in society and supports their parents and carers. A-Rhyme-a-Week is a phonological awareness program, on the Curry School of Education, University of Virginia, web site. It features thirty different nursery rhymes in a fun and appealing approach to fostering an important component of early literacy acquisition. A-Rhyme-a-Week is just one aspect of Webbing Into Literacy (WIL) a Head Start Program, which includes 101 Best Books for Children. Its author is Laura B Smolkin. The Stuttering Home Page, a project of Judith Kuster, in consultation with John C. Harrison, is dedicated to providing information about stuttering. This recently revamped web site is aimed at multiple audiences, including parents of children who have been recently diagnosed with childhood apraxia of speech (CAS), parents of late talkers, teachers and speech-language pathologists. It also provides a constant stream of information for parents of older children with CAS who are negotiating the challenges of school, the workplace and life in general. It provides abundant support, well-referenced information, and links to carefully selected resources. This is a model early identification and intervention program based in the Department of Communication Disorders at Florida State University. Staffed by speech-language pathologists and interdisciplinary consultants, the project is funded to evaluate the communication development of children from 6 to 24 months of age. The site makes an immediate and practical contribution to clinical practice with its handout materials which can be downloaded and printed. For more than 20 years LinguiSystems have provided quality materials for clinicians and teachers of students with special needs. NZSTA is the professional self-regulatory body for speech-language therapists in New Zealand. It is a tiny association by international standards, but what a powerhouse of talent, enthusiasm and industry! This site focuses on adoption and children with disabilities or special needs and includes a comprehensive resources page. Scott Bradley's page contains a listing of university programs in speech language pathology and audiology. This is just one section of Professor Quesal's entertaining and informative Web Site. It also contains some words of wisdom about approaching the things you have to do systematically. The essays on stuttering are personal, thought provoking, challenging (e.g., The Role of the Stutterer in Therapy) and quite likely to change the way you think about fluency disorders. The HONcode is not an award system, nor does it intend to rate the quality of the information provided by a Web site. It only defines a set of rules to: (1) hold web site developers to basic ethical standards in the presentation of information; and (2) to help make sure readers always know the source and the purpose of the data they are reading. Speech Pathology Australia is the official body representing approximately 2750 speech pathologists across Australia. The Association lobbies government on behalf of members and their clients for improved services and facilities. It works with the media to explain what communication disorders are and how they can be overcome and it also sets professional standards for its members. Branches are located in all states and territories. Evelyn Jane's video is recommended. Registered members of the Royal College of Speech and Language Therapists providing private speech and language therapy services throughout the UK. Does Tom Brennan ever sleep? This frames disabled treasure trove is easily navigable for vision impaired visitors using speech and Braille access. This is the number one SLP resource on the Internet. Judy Kuster's Net Connections is legendary in speech-language pathology circles around the world. See for yourself! "I'm inspired by the nicely spoken Man of Steel, the wonderfully composed Clark Kent, and star reporter Lois Lane: she of the impeccable fashion sense and nicely rounded compliment. As Speechwoman I try to combine the best of each of them. And like Ms Lane, I want to be appreciated solely for my intellect and industry: not for the way I look in Lycra®." "Up close, he's the most magnificent figure of a man." "Don't fall for me farm boy, I don't have time for it." Site-of-the-Month awardees are very welcome to display the Speechwoman logo on their award winning site, page or resource. The external links throughout this web site point to Speech-Language Pathology related web sites and resources that are considered helpful or interesting for SLP/SLT consumers, students and professionals. Occasionally, someone asks who decides whether or not links will be included. The answer is, I decide, but that I welcome site suggestions. The resource description aims to provide an objective sense of what each of the reviewed Internet resources includes, using seven key words. The key words are: Advocacy, Education, Professional, Consumer, Student, Guide and Links. A parent consumer operated advocacy site. A university, government agency, organisation or SLP/SLT Professional or Personal Home Page that provides SLP/SLT- related information. A site that provides information for SLP/SLT professionals. A site that provides information for SLP/SLT consumers. A site that provides information for SLP/SLT students. A guide, meta guide, directory or search engine. A site that primarily comprises a list of links. The Resource Evaluation aims to provide a subjective sense of the overall standard of the resource, in terms of four criteria: quality, usability, authority and design. Quality of the content of the web site. Readability, organisation, ease of navigation. The "standing" of the author and the use of scholarly methods including appropriate citations from peer reviewed literature. A triple plus (+++) denotes excellent, and a double plus (++) denotes good, and a single plus (+) denotes adequate. No plus sign denotes less than adequate. For example Quality +++ means "the content of the site is of excellent quality". Two additional criteria, "Technical" and "Non-technical" are included to indicate whether users require a technical knowledge of the topic to understand the content of the site. Many sites comprise a "mix" of technical and non-technical information. Indicates that some knowledge of topic is required in order to understand the content of the site or resource. Indicates that topic knowledge is not required in order to understand content of the site or resource. From June 1998 to July 2011 the evaluations and ratings for every site-of-the-month were displayed on the old speech-language-therapy.com site. This practice was discontinued for the new site because for the whole thirteen year period not one word of feedback was received about the evaluations, the ratings or the review format itself. They were time consuming to prepare and obviously not of interest to many, if any, site visitors. The task of reproducing the 1998-2011 evaluations and ratings that appeared on the old site and displaying them here is too big an undertaking, especially given the lack of enthusiasm for them. Apologies if there are a few people out there who miss them.